The non-profit organization “Il Sorriso dei miei Bimbi” (“My children’s smile” – Translator’s note) was officially founded in 2002, born from an idea of Barbara Olivi, an Italian living in Brazil, who since 1998 had been developing educational programmes for children and youth. 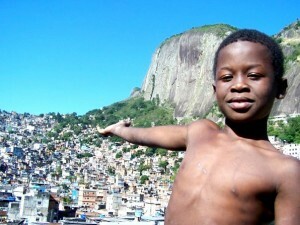 Located in one of the largest favelas in South America (Rocinha, in Rio de Janeiro) Il Sorriso dei miei Bimbi is a non religious, independent, non-profit organization; it promotes ideas and partnerships and its projects have been successfully carried out over the years thanks to numerous private donations. The non-profit organization aim is to improve social and educational conditions within the Community of Rocinha. In Brazil, in compliance with current laws and regulations, the non-profit organization works in partnership with the Brazilian non-governmental organization “Amigos da Vida”, which founder and chairwoman is Barbara Olivi. Barbara has been living in Rocinha for over 12 years and she, together with her husband Julio de Rezende and their staff, promotes and organizes projects and activities.